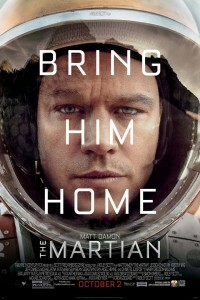 I recently read the book “The Martian” by Andy Weir and was delighted to see that it’s been made into a film. I found this book fascinating as it was a great exploration into the mind set of a man that wouldn’t be beaten, no matter how bad things seemed. For him, it was just a case of controlling what he could control. Making sure that he tackled each problem as it arose and anything that was out of his control he left alone. What first gave the idea for the story? I was imagining a manned Mars mission, putting it together in my mind. Naturally, you have to account for failure scenarios and have plans for what the crew could do. I realized those failure scenarios made for a pretty interesting story. Did you have to research the possible problems, or do you just naturally catastrophize! I did tons of research. But for the most part, each problem flowed organically from the previous problem’s solution. At least, that’s what I was trying to do. Problem first. I wanted that as realistic as possible. Then I’d work on a solution. If it was impossible to solve, I would retroactively add in some bit of tech he would have access to so he could solve it. In some cases, I couldn’t think of any solution and couldn’t think of any changes I could make that would lead to a solution, so I would just not have that problem come up. Do you feel that you, yourself are a particularly good problem solver when you’re in a tight situation? Pretty good, yeah, but not on Mark’s level. How key was Watney’s flippant personality to being a problem solver? I don’t think it was critical to his problem-solving skills, but it was needed for the narrative. I didn’t want the book to read like a Wikipedia article. I had to have an interesting/funny narration or it would just be a bunch of dry math. How did you manage your own fears of writing the book? I never had any fears about writing. I mean, I had the usual worries about whether or not people would like it. But they weren’t significant. I just wrote it because it was my hobby. I didn’t even expect it to take off like it did. If you were to go back and rewrite it, what would you do differently? I’d probably have something other than a sandstorm be what strands him there. That’s the biggest scientific inaccuracy in the book. Much of the book is written in the first person, what were some of the challenges and benefits of writing it this way? The biggest benefit is it let me show the reader what Mark was thinking and feeling. The main problem was that I had to change narration style to show what was going on at NASA and aboard Hermes. Have you ever been in a situation that seemed dire, but you were able to work your way out of it? I’ve never been in a life-threatening situation or anything like that. I can’t think of any examples of me “clevering” my way out of anything, actually. I guess I’ve had a boring life. I hope you enjoy the film as much as I enjoyed the book! Let me know what you think!